Voters in the First and Second Commission Districts agreed with the high court decision. 52% of respondents in the First District agreed with the Supreme Court’s ruling, while more than 53% of voters in the Second District approved the ruling. The First District is largely centered around Knoxville’s African-American community while the Second District is also entirely inside the confines of the City of Knoxville. Interestingly, the First and Second Districts are likely the least affluent areas in Knox County. The Fourth and Fifth Districts, Sequoyah Hills and Farragut, are the most affluent areas in Knox County and voters in those districts did not approve of the Supreme Court ruling. 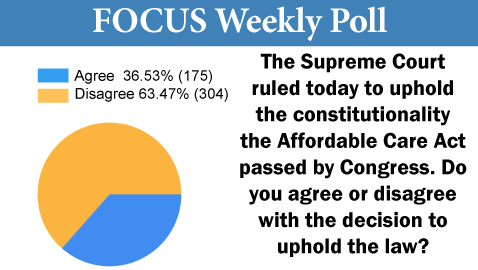 Just over 60% of voters in the Fourth District disapproved of Obamacare being upheld, while quite nearly 70% of voters in the Farragut-based Fifth District disagreed with the Supreme Court ruling. 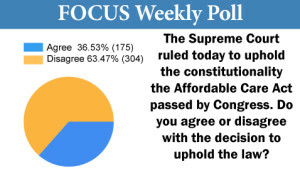 Outside of the City of Knoxville, the Eighth District showed surprisingly strong support for the high court ruling with more than 40% of voters saying they agreed with the Supreme Court decision. The district with the most voters disapproving of the Supreme Court decision was the Ninth District, which is comprised of South Knoxville, followed closely by the Sixth District, which is northwest Knox County. The age group most strongly in agreement with the Supreme Court decision were voters aged 18-29; a whopping 67% agreed with the court ruling.